In 2010, Carolinas HealthCare System, faced with a rural hospital that wasn't financially sustainable, made the unusual move of rebuilding it with a focus on primary care. "It was at the end of its useful life," Michael Lutes, Carolinas HealthCare senior vice president and president of its Southeast Division, said of Anson Community Hospital in Wadesboro, N.C. Located about 50 miles southeast of downtown Charlotte, nearly a quarter of Anson County's population of 26,000 lives in poverty, according to U.S. Census Bureau figures. The county has been regarded as one of the unhealthiest communities in the state for years. 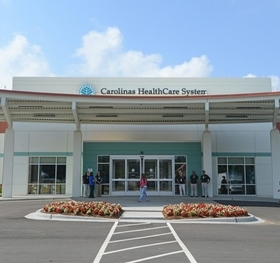 In 2012, Carolinas embarked on a project to overhaul Anson Community Hospital to make it a facility that was better equipped to address what Lutes said were the underlying chronic health conditions that were at the root of repeat visits to the emergency department. "What we wanted to do was build a model that was focused on improving the health status of Anson County," Lutes said. Instead of fighting the battle to keep primary-care patients out of the emergency department, Carolinas embraced it. The system rebuilt Anson Community Hospital into a 43,000 square-feet, free-standing 24-hour ED with 15 inpatient beds and renamed Carolinas HealthCare System Anson. Central to the new facility's operation was a medical home model that embedded primary-care physicians within the ED to take care of the non-emergency needs of visitors. Patients are first screened and then are steered into emergency or primary care by navigators. "We realized that in a lot of communities, the ER is a main access point to receiving care," Lutes said. "I think our model is recognizing that and then using an intervention before they go into the ED." For years, the conventional view of the failings of the American healthcare system has been encapsulated by images of overcrowded hospital emergency departments filled with patients who are there as a last resort for their non-urgent health needs because they don't have access to primary care. Such images have served as a backdrop for the ongoing debate over expansion of health coverage through the Affordable Care Act, with the notion that doing so could either increase or decrease ED use. For rural healthcare providers, reducing use of the emergency department can determine whether a facility will continue running. With thinner operating margins compared to larger, urban medical centers, rural hospitals often have a higher proportion of ED patients who are uninsured or can't pay their insurance deductibles, which results in higher rates of uncompensated care for such facilities. But a proposal published this week in the Annals of Emergency Medicine suggests embracing innovative models like the one at Carolinas may hold the key for improving both the delivery of care and health outcomes for rural communities through use of the emergency department. "I think in urban areas, efforts to reduce emergency department utilization are extremely important," said paper lead author Dr. Margaret Greenwood-Ericksen, an emergency medicine physician at the University of Michigan and a researcher at the school's Institute for Healthcare Policy and Innovation. "But urban and rural areas are very different in many ways—so applying an urban model to a rural area doesn't really seem to be effective and doesn't take into consideration some of the barriers that are faced in rural areas." One of those barriers is the dearth of access to healthcare services in many rural areas, where hospital emergency departments may serve as the closest provider. Greenwood-Ericksen said rural hospitals could optimize their efficiency by looking at forming partnerships between emergency medicine and primary care. She said many are already integrated in terms of staff with a mix of providers trained in both emergency medicine and primary care. "You get these unique and wonderful opportunity for those providers to talk with one another, and that is in some ways the best type of care coordination," Greenwood-Ericksen said. Such an integrated model has seen some positive results in Anson. The number of ED visits declined 7% in 2014, the first year Carolinas HealthCare's Anson facility began operating under the new model, and there have been moderate annual declines in ED visits since. "Taking those visits that were going into the ED—many of those we weren't being compensated for—and putting them in a lower-cost setting has obviously helped the hospital from a financial perspective," Lutes said. Carolinas' model has helped the facility become financially sustainable at a time when the number of rural hospitals closing their doors has increased. Nationally, more than 80 rural facilities have closed since 2010 with most occurring in states such as North Carolina, which opted not to expand Medicaid to include all adults earning up to 138% of the federal poverty level. "The fact that we found a different model to keep this hospital open, and at the same time improve health outcomes and access, I think has been pretty amazing," Lutes said.